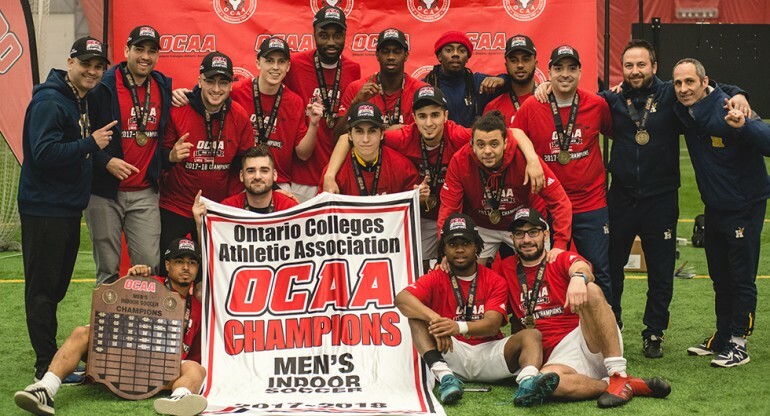 Humber’s men’s indoor soccer team overcame adversity after losing half of its squad after last term’s college strike to become Ontario Colleges Athletic Association champions. “We had a few injuries and due to the strike as well, we lost a few players as a result of that,” said coach Michael Aquino of the Humber men’s indoor soccer team. Defender Jamie Scott said both the leadership of the seniors and the heart of the younger players stepping in after losing a number of players after the five-week faculty strike helped them reach the championship. Co-coach Alex Sabatini said he never lost hope in winning the championship because he felt the team has always shown talent. “For the indoor, we have very good players at the school. We know our group very well, we know our competition,” Sabatini said. Sabatini said the Hawks are very good at recruiting championship teams and could see one in the men’s indoor soccer team. “Our forte has been the depth we have carried throughout the years,” he said. “Schools don’t have the depth we have, due to our recruiting. “But even for indoor, some schools that are mediocre outdoor actually have decent indoor teams because it’s only five and a keeper, it’s only six a side,” Sabatini said. “With a group of 10 players you could actually do quite well,” he said. “But our guys stepped up in right moments and we have very good individual players. We have good, quick, speedy players with great soccer IQ. “With that I knew we had a team that could be very successful,” Sabatini said. He said Humber students should expect great, skillful games from the indoor soccer team. He has high hopes for his team next year and will hold open tryouts for those who aspire to be a part of the team. “I think with our group we are one of the heavier hitters in the OCAA, I always think we will have an opportunity. We have a good opportunity going into next year, but we are looking to instill some core values to the players,” Sabatini said.